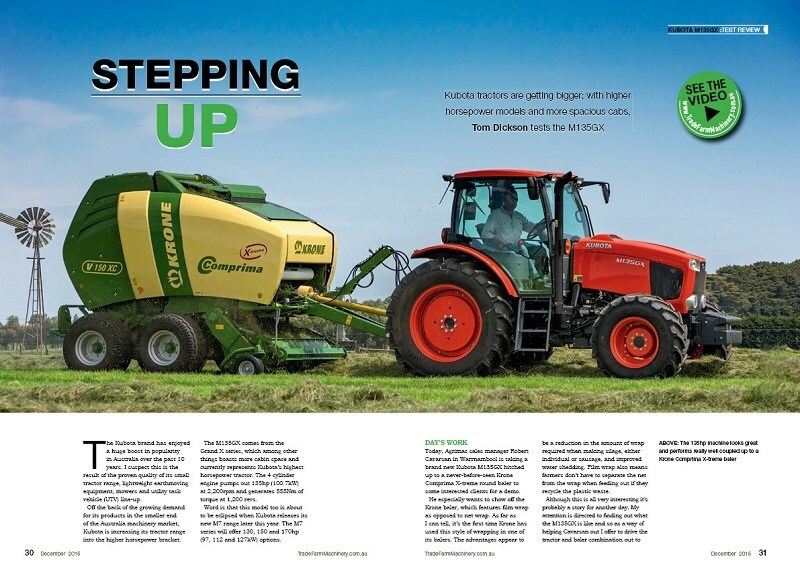 New Farm Machinery's December 2015 issue goes on-sale from November 9. Tom Dickson takes the Kubota M135GX for a spin, and thinks the tractor is a true performer with the looks to boot. 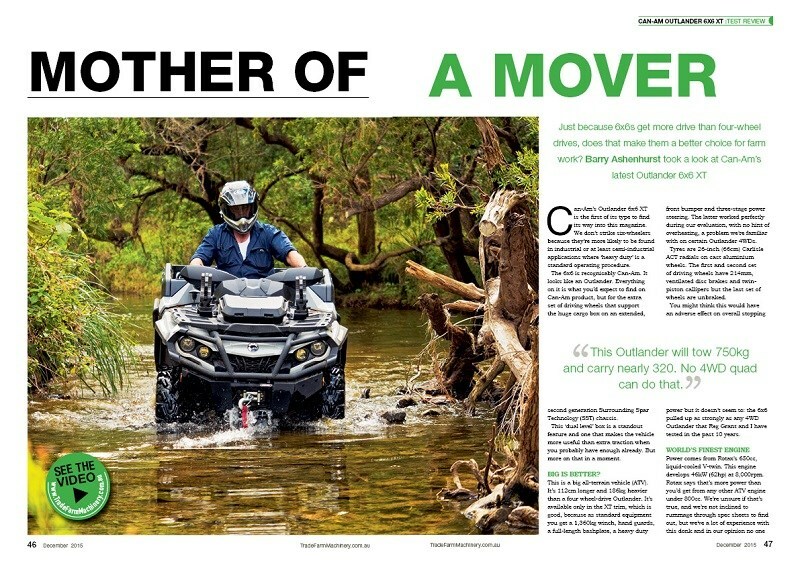 All-terrain vehicle (ATV) aficionado Barry Ashenhurst got on board the new Can-Am Outlander 6x6, an equipment not typically found on farms. Matt Wood checks out the Faresin FH7.30C Agri PTO telehandler. “It’s possibly what’s happening out front that makes the little Faresin quite interesting,” Wood says. Dave Grayling is young, intelligent and a daring entrepreneur not afraid to take his chances in a challenging manufacturing market. Anna Game-Lopata speaks to him. 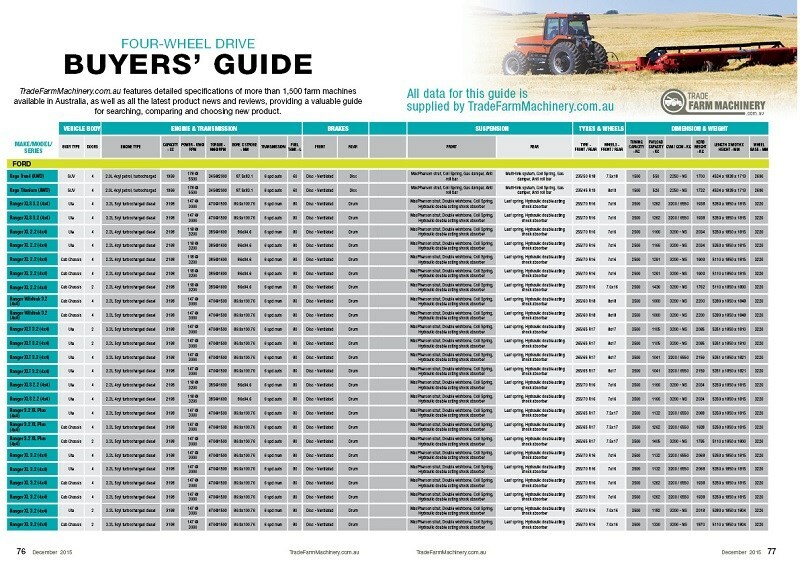 Don't miss our 4WD, utes and SUV buyers guide this month. 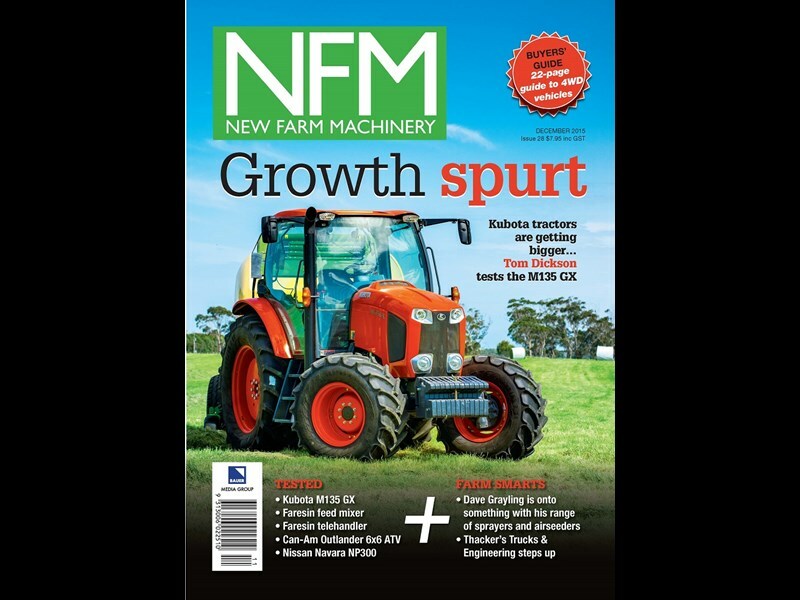 New Farm Machinery’s final issue goes on-sale from November 9. Inside, Tom Dickson takes the ever popular Kubota M series 135GX for a spin. He says Kubota, a company stepping up into higher horsepower models, has got the look well and truly spot on for its M135GX. "It casts an imposing stature, with a look of strength, below the bonnet line while at the same time incorporating a slim roofline to create a sleek modern look," Dickson says. "You wouldn’t have to work at night and hide it in the shed during the day to avoid embarrassment of owning an ugly tractor," he says. "Don’t laugh, I knew a few farmers who kept their Belarus tractor out of the front paddock for this very reason." Find out what else he had to say. Watch the video. Managing editor Anna Game-Lopata sits down with Dave Grayling who is an agricultural service and equipment designer based in Wellington, New South Wales about an hour from Orange. He started up his own business Graytill building air seeders, but the quietly spoken young engineer quickly picked up a market need for a compact, road-ready all-in-one spray unit which he set about developing in 2013. 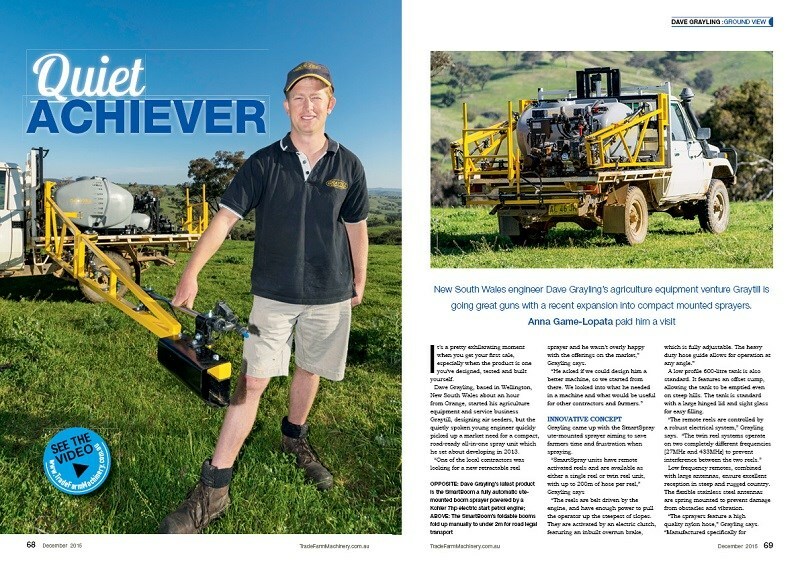 Grayling came up with the SmartSpray ute-mounted sprayer aiming to save farmers time and frustration. Then, based on feedback from his contractor customers, he quickly followed up with a ute mounted boom spray, the SmartBoom and the 12-volt VersiVolt, a compact spray unit for ute or utility task vehicle (UTV) with a decent-sized pump he thought would suit just about anybody. Don’t miss the full story in this month’s issue. Watch Anna's video interview with Dave Grayling. Another inspirational team is Thackers Trucks & Engineering in Bendigo, a company recently appointed the region’s fully-fledged dealership for the recently rebranded AWD Group, which incorporates Dieci Telehandlers and Rough Terrain Plant Hire. Justin Thacker and his brother Grant, who are the brains and brawn behind the Thacker business, have worked extremely hard to deliver the best possible service to their customers. They’ll now offer the full range of AWD Group products and services and say they’re looking forward to the challenges ahead. In this issue, our comprehensive buyers guide covers utes, SUVs and cab-chassis four-wheel drives available on the Australian market. 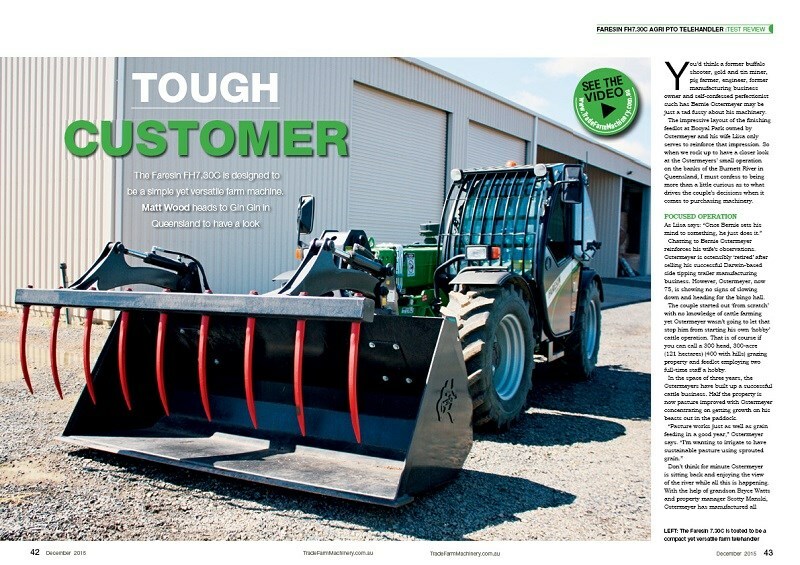 Recently we announced that New Farm Machinery magazine is merging with Farms and Farm Machinery magazine to offer you a stronger, one-stop shop publication featuring quality editorial and classifieds.